Stefan Rummel (currently residing in Berlin) was born in Nürnberg, Germany, where he graduated from the Academy of Fine Arts. 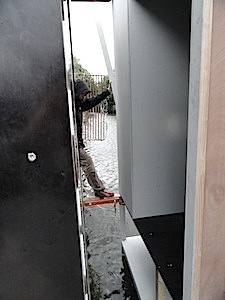 For the Resonance network Stefan created Articulated Chambers, a public space installation that can be heard-seen at the Bassin in Maastricht (the Netherlands) until the end of August. Next versions of the piece will be installed in Riga (Latvia) later this year, and in Kortrijk (Belgium) as part of next year’s edition of the Flanders Festival. An adapted (indoors & dry) version of the installation was part of the Extensions exhibition, from June 17th till July 17th 2011, in the Lydgalleriet in Bergen (Norway). As a student and graduate from a fine arts academy, Stefan, you have a firm background in the visual arts. “I was at the painting department, and the professor was really a painter. But it was interesting, and we had a lot of different ideas in this class. He was very open for different media, and we did performances, photos… With another guy I got involved in Aktionskunst, and I got more and more interested in getting away from painting. I must say that this was partly also because I didn’t have so much ideas about using colors. I didn’t like colors so much. At the time I was more into gray and stuff. So I felt somehow that it was more interesting to open up a space, like one does with installations. What fascinates me about this, is that you walk into it. 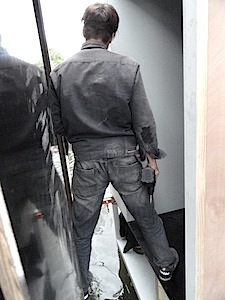 And when you do, you are kind of surrounded by the work… Which is also the case with sound installations. And from the very beginning, already back at the academy, you began incorporating sound in your work? And you have been pursuing this ever since. Installations. With sound? Contrary to the other installations that up until now were produced for the Resonance project, you chose to create a piece outside, in public space. 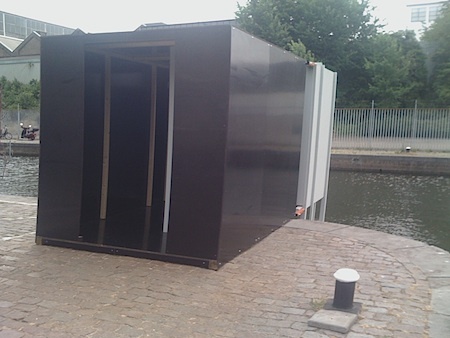 It thus came about that Stefan Rummel constructed two big wooden boxes at the Bassin in Maastricht, assisted by his companion Anja Gerecke and Stichting Intro’s tech wizz Paul Caron. The boxes are almost (but not quite) cubes. One of them (the black one) is placed on the ground, at the quay. The second box (the grey one) is floating on the water; like a raft, carried by pontoons. 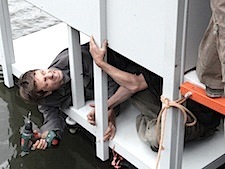 The two are connected by means of four metal hinges and a small wooden gangplank, that permits one to pass back and forth between the one and the other. One can enter the two rooms, which indeed are articulated chambers. The connecting part is flexible enough to cope with the undulations and changes in the water level. Its flexibility also gives visitors an impression of movement. 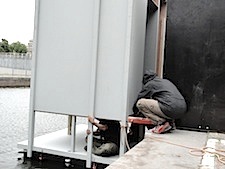 Inside the boxes there are six small loudspeakers, that project a soundscape. Though also when you enter the installation, it may take a while before you become aware of the speakers and the sounds that they bring forth. 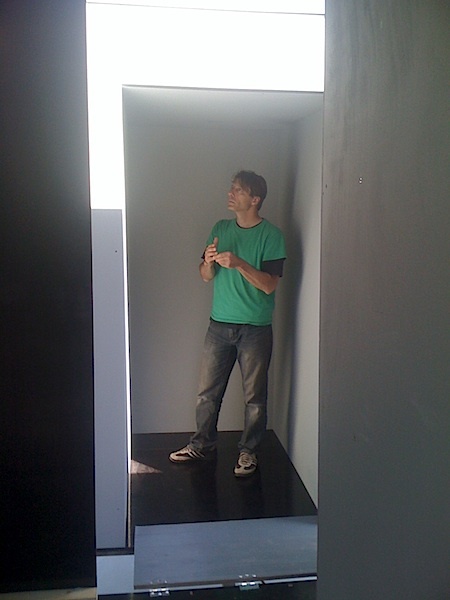 Does the part inside of the first chamber (the box inside the box) correspond in dimensions to the second chamber? So that the room that is floating on the water is like an echo, like a transposition, of the inside of the room that is standing on the quay? To me it looks like that. It is late afternoon, the monday after this year’s Kunsttour weekend in Maastricht, which included Stefan’s Articulated Chambers as part of its sound art program. The Articulated Chambers stayed on, and have since been open for the public passing at the Maastricht Bassin, 24 hours a day and 7 days a week. The installation will remain there until the end of August. This continuous accessibility is a fascinating aspect of the work. Not only will different types of weather and the different light at different hours account for many different possible views of the work. The work will also always sound differently, because of the ever changing sounds of the city. This city soundscape surrounds the work, and becomes a part of it. At times the city will be loud and dense, at other moments it will be far more quiet, with soft and sparse, little pretty, sounds. These will mix with Stefan’s composed soundscape inside the boxes, that is always being played back at the same volume, irrespective of the loudness of the sounds that come whirling in from the outside. The power needed for the playing back of the piece’s soundscape comes from solar cells, thus making the installation self-sustained: it supplies its own energy; also when the available daylight is less ‘energetic’ than that of the piercing sun, spreading all over the Bassin the afternoon that I spoke there with Stefan. We are sitting inside the first of the two wooden rooms, the black one, and profit from the shadow and relative coolness inside. We hear how the sound of the traffic outside mingles with the sounds projected by four loudspeakers inside the black chamber, and – from a bit further – the sounds coming from the two speakers that are built into the smaller, grey, room, the one that is floating on the water. So visitors should stay a while, when they come here and visit your Articulated Chambers. Could you tell a bit more about the sounds that you use for the soundscape? How did you go about selecting them? What, for example, are we listening to right now? How long have you been recording to collect all the material? Did you record continuously, while you were in Maastricht? Or just during certain periods? Did you record every day a bit, or did you do all the recordings in one long stretch? What do you mean by ‘mistakes’? You use several tracks, each of a slightly different length. And each is playing back as a loop, so that their ‘sounding together’ will be perceived as changing all of the time. But is there something that characterizes the different tracks? How does, for example, the track in the ‘water room’ relate to the tracks in the ‘land room’? Everybody will surely agree that Articulated Chambers very nicely fits the surroundings at the Bassin, even though (or is it because?) it appears to be something of a visual paradox. It says: “Oh yes, this is where I belong!” but at the same time asks: “What the hell am I doing here?” I could easily imagine the work to be permanently installed here – especially given the cultural destination of the area and the Timmerfabriek building. What are your thoughts on that? How important is the material for this work? The fact that it is made out of wood? We sit quietly in the black room for a while. We smoke a cigarette, and listen to the sounds that are coming from the speakers in the black box, mingling with the sounds of the buses, trucks and motorcycles that are passing outside, as well as with the occasional slow, rhythmic squeaking and crackling of the hinges and gangplank connecting the gray and the black room. I hear the ringing of bicycle bells. At some point I also hear the faraway singing of birds. But were these birds singing outside of the Articulated Chambers, or did their song come from the inside, as a part of Stefan’s sound scape? It will be interesting to see how Articulated Chambers will fare, throughout this summer out here in the open in Maastricht. Maybe some passers-by will find it makes a pretty good spot to spend the night. What would you say if some morning you’d arrive here, and find someone sleeping inside your work? 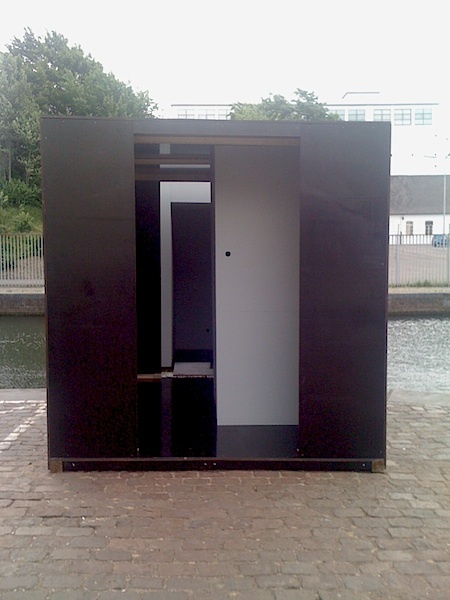 Stefan Rummel’s Articulated Chambers can be seen, heard and felt, day and night, 7 days a week, at the Bassin in Maastricht, until the end of August 2011. Go there, discover, feel, listen, see-hear, hear-see and enjoy! You are currently reading Something you walk into, something that surrounds you at Resonance - European sound art network.